The Konica Minolta PS7000 publication scanner is a superior system for scanning large-sized books, artwork, ledgers, and other bound materials. Its face-up scanning system means you don't have to turn volumes over in the face-down position, so your materials require less handling and fragile bindings are protected. 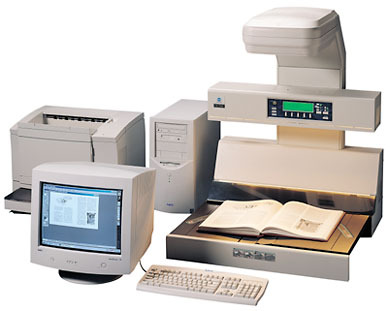 Scanning area of 17" x 23-2/8" scans oversized bound volumes with ease. Adjustable cradle provides gentle, stress-free support to the spine of book volumes. Fast scanning at only 4-1/2 seconds per page for 8-1/2" x 11" originals. Clean, crisp images with up to 600-dpi resolution. Automatically compensates for curvature of pages. Automatic edge detection masks out borders and the area beyond the page for clean, professional-looking results. Output scanned image directly to a printer or PC, with a single button.